All of the kids in Brian’s class were sent home with stuffed animals for a night. They were to be zookeepers to their animals and then write a short (pre-written-fill-in-the-blank) story about their time with their animal. Brian has a little collection of stuffed animals but has only showed any sort of interest in the ones that are somewhat human- Eddie, Woody, or Buzz. Yet, this little giraffe stole my boy’s heart. It was obvious from the start Brian was going to take his new zookeeper position very seriously. When I pulled him out of his backpack he yelled “Gi-aff!”. He brought him to his room and set him on his train table while he pushed his trains back and forth. He was hugging him when he was sucking his thumb. He sat him on the toilet to watch him take a bath. He slept with him. He ate breakfast with him. We wrote our story which had him writing a total of 10 words without one whine, groan, or scream. He happily did it all the while saying “Gi-aff, Gi-aff, Gi-aff”. 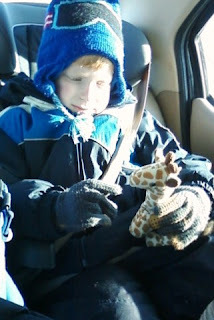 In the morning we were just pulling out of the driveway to go to school when I remembered the giraffe who had to be put down so Brian could put on all of his snow gear. I looked in the rearview mirror and asked, “Do you have your giraffe?” A look of fear, shock, and sadness went over his eyes as he yelled “Oh nooooo gi-affe!! !” I ran back into the house to rescue his new best friend and the giraffe was greeted with bigger smiles and hugs than I usually get.